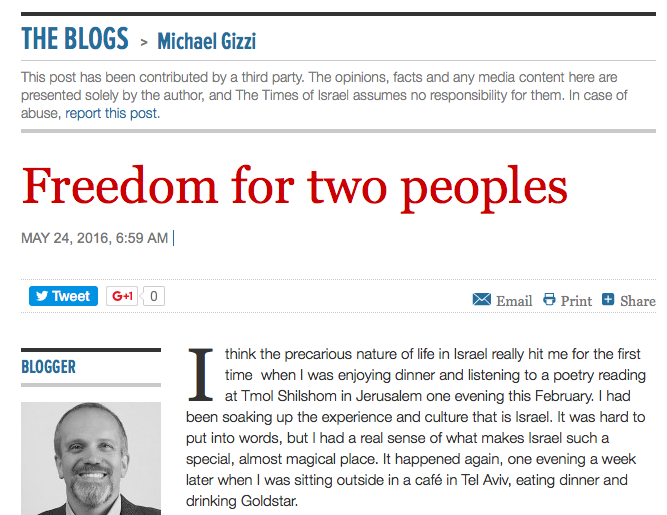 I am now blogging for the Times of Israel, an English-language newspaper in Jerusalem. Posts on the Israeli-Palestinian conflict will be posted there, and linked here. A reflection on two very different perspectives on freedom. Israelis seek to be free from terror. Palestinians seek self-determination. Both are essential to the peace process. Yes, I am blogging a link to my own writing, hosted on my friend Bruce Reyes Chow’s site. ”What do we make of this decision? I would argue that the Court’s unwillingness to even address the constitutional issues at stake from Employment Division v. Smith suggest that the Court is not really interested in religious liberty. The five justices in the majority see their interpretation of RFRA as a way to limit part of President Obama’s Affordable Care Act. The same give justices have extended First Amendment speech rights to private corporations in campaign finance matters, the decision today broadly expands the power of corporations, in what truly is a legal fiction. Corporations do not profess religious beliefs. It is a farce to claim they do. This case is about advancing corporate power, not religious freedom. Yes, my response to the ignoramus who proposed caging in all the animals and opening up Yellowstone to timber harvesting. An excellent summary of the legal issues to be dealt with in the #PROP8 case from yesterday. michaelgizzi answered your question: Do you know how a Supreme Court Justice is chosen? And thus, one of the least impressive justices of the post-war period was nominated. Source: I do not remember where I got the quote. But probably from a judicial process text. Politicalprof: Know Why the Boy Scouts Care if You’re Gay? Link: Politicalprof: Know Why the Boy Scouts Care if You’re Gay? Well said. I’d give another reason why they care if you are gay. Their largest partners in terms of supporting troops: The LDS Mormon Church, The Roman Catholic Church, and the Southern Baptist Convention. Hmmm… all three… rabidly anti-homosexual. Now is a good time to re-read Martin Luther King’s Letter from a Birmingham Jail. The message is very appropriate in the summer of 2012. The fight for justice and equality continues unabated. The breathtaking radicalism of the Supreme Court’s minority opinion on the health care law surely got the chief justice’s attention. Interesting piece by a long-time court insider.